President Donald Trump speaks at CIA Headquarters in Langley, Virginia, on January 21, 2017. 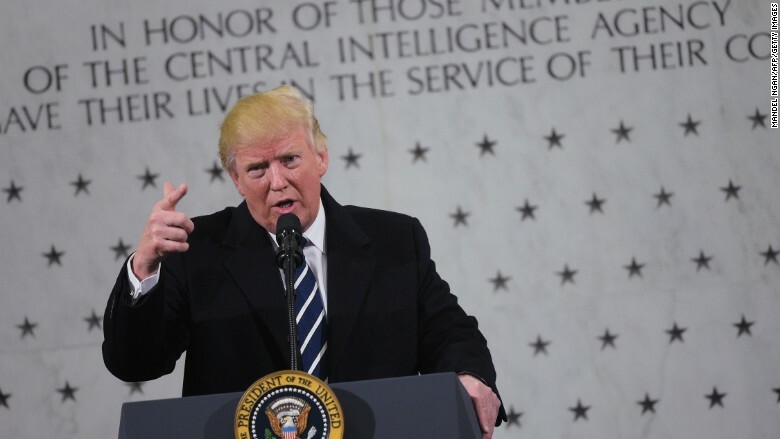 President Donald Trump started and finished a speech he gave at the CIA headquarters Saturday afternoon by criticizing the "dishonest media." Several of the things he said were inaccurate. Some members of the media expressed astonishment about the setting and the tone of the speech. "The stars on the wall behind Trump, who is talking about his crowd sizes and complaining about the media, mark dead CIA operatives," Los Angeles Times columnist Cathleen Decker tweeted. "The president just tried to rally CIA workforce around the idea that media is the enemy. Let that sink in," wrote Mark Mazzetti, a Washington investigations editor at The New York Times. Trump himself called it a "war," further ratcheting up his extreme anti-media rhetoric from the campaign trail. "As you know, I have a running war with the media. They are among the most dishonest human beings on Earth," Trump said. Some CIA staffers in the room applauded the insult, but the senior leadership in the front rows did not, according to a CNN producer who was there. "They sort of made it sound like I had a 'feud' with the intelligence community." Nonsense, Trump said, "it is exactly the opposite, and they understand that too." In fact, Trump repeatedly and publicly questioned the country's intelligence services amid reporting about Russian attempts to interfere in the election. "He referred to it repeatedly in tweets as 'intelligence' in quotes. He was undermining" them, CNN chief national security correspondent Jim Sciutto said afterward. CNN chief political correspondent Dana Bash added, "It's unfortunate that he said that there, on hallowed ground. It happens to be not true that we conflated things that he said. All you have to do is look at his Twitter feed to see what he said." Trump also exaggerated the size of the crowd at his swearing-in ceremony Friday and complained about what he said was unfair coverage. He said it looked to him "like a million, million and a half people" were in attendance for his inauguration, but that a television network (which he did not name) "showed a field where there was practically nobody standing there." He also said the crowd "went all the way back to the Washington Monument," but it did not. Major television networks shared a camera at the top of the monument that showed lots of open space during Trump's inauguration. Trump even described the inauguration weather inaccurately, saying that the skies became "really sunny" after his speech, when in fact it remained cloudy. At the beginning of the speech, Trump struck a more positive tone about the press, saying "they did treat me nicely on that speech yesterday." But at the end, he returned to his anti-media rhetoric. He made a brief mistake by a Time magazine reporter, Zeke Miller, sound like an ongoing scandal. When a small group of journalists, known as a "pool," was allowed into the Oval Office on Friday evening, there was some confusion about whether a bust of Martin Luther King, Jr. was still there. The bust had been controversial when former President Obama moved it into the Oval Office, replacing a bust of Winston Churchill that had been there. Pool reporter Zeke Miller of Time initially couldn't see the MLK bust, and he sent word to the rest of the press corps that it had been removed. But it was still there, albeit out of Miller's line of sight. A correction went out to the press corps within half an hour. Trump press secretary Sean Spicer tweaked Miller about the incident on Twitter, calling it "a reminder of the media danger of tweet first check facts later." Miller apologized to his colleagues, and Spicer tweeted, "Apology accepted." Trump said the incident showed "how dishonest the media is." He said the MLK bust removal was a "big story," when in fact it was not treated like a big story by any major news outlets. Trump concluded his comments about the press by saying, "I love honesty. I like honest reporting."